Vortex has announced several improvements to their cast-iron right angle gearboxes. From the casting, to the gearing, to bearing improvements, Vortex is determined to separate themselves from their competition. Vortex has taken the already rigid cast-iron housing and added an internal flange to the gearbox output, virtually eliminating axial movement of the output shaft. This will decrease friction and improve efficiency. Vortex has moved past the industry standard by introducing a dual-bearing assembly on the input section of the gearbox. Most manufacturers continue to rely on the attached motor bearings to support the input section of the gearbox. This single design improvement dramatically increases the stability of the input, and the entire gearbox. Another improvement is the gearing. The major enemy to worm gearboxes is heat. Vortex discovered that by changing the profile of the gearing, they were able to reduce the heat and friction inside the gearbox. Many manufacturers view right angle gearboxes as a commodity item, with lowering the cost of production being the primary goal. 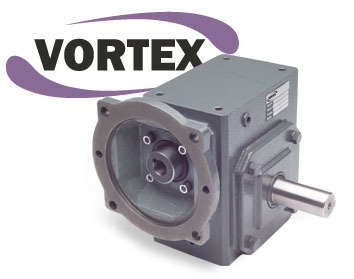 Vortex has committed to offering the highest quality gearbox on the market. They just won’t cut corners when it comes to quality, and the customer wins!